I repost this story every year, because soldier dogs are truly amazing heros and we must always honor our troops and our service animals and all the fallen spirits that have been taken, for oh, too many reasons. Take a moment, right now, just a few seconds, and be thankful for the wonderful service people that work so hard to stop some really terrible things from happening around the world. 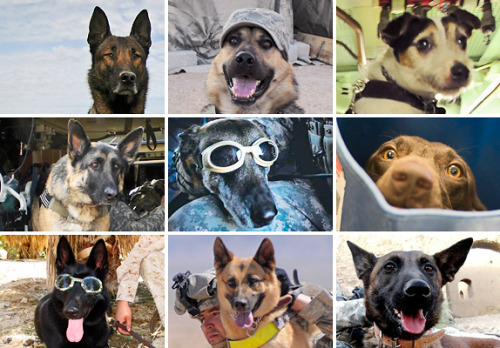 These are some of my favorite images from the book Soldier Dogs. There are more pictures in our slideshow today. 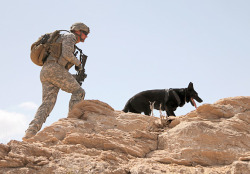 Military Working Dogs play a crucial part in America’s armed services. 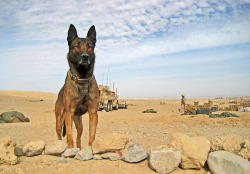 The best known “Soldier Dog,” Cairo, put crucial canine skills to work in the SEAL Team Six operation that killed Osama Bin Laden. 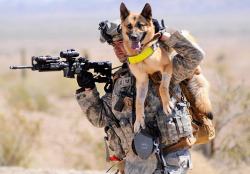 Other Military Working Dogs serve as everything from bomb sniffers to troop companions to search and rescue dogs (and also serve in darker roles, such as duty at Guantanamo Bay). 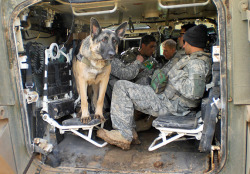 Their handlers and trainers, devoted dog lovers down to a man, form an unusually close-knit fraternity within the military. Just another DogDaz morning at the zoo! DogDaz salutes those that lost their lives, their loved ones, and their sense of security in the terrorist attacks of 9/11/01 and all terrorist attacks ever. May the world find its way to peace. Soon. 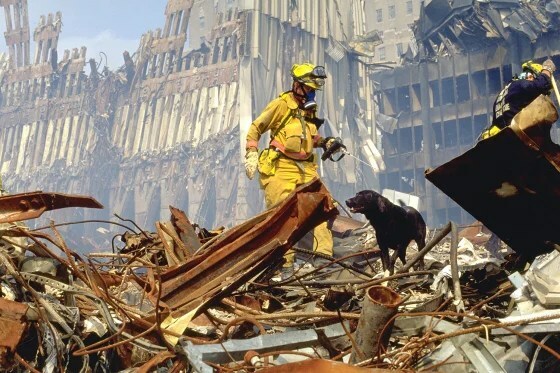 More than 300 specially trained search-and-rescue dogs were deployed at Ground Zero in the days following the 9/11 terrorist attacks. On Sept. 11, 2001, Genelle Guzman-McMillan was working in her office in the World Trade Center when she heard a terrible noise outside. As she raced down the stairs, she felt the building collapse around her. Twenty-seven hours later, she would be the final living person rescued from the rubble at Ground Zero. She was not found by a human equipped with special gear. Instead, her savior was a dog. 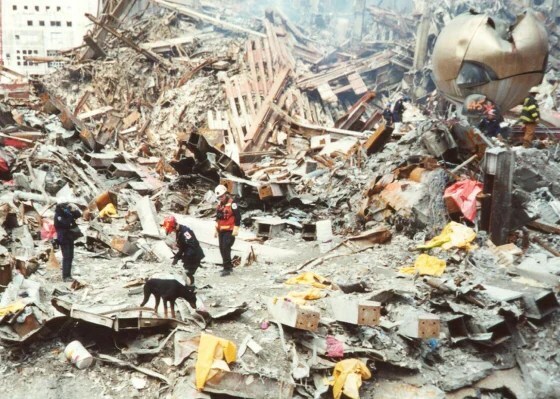 Genelle Guzman-McMillan (in blue dress) was the last person to be pulled alive from the World Trade Center rubble in New York after the Sept. 11, 2001 terrorist attacks. She is pictured with husband, Roger, and daughters Kimberly, Kaydi and Kellie at their home in Long Island, N.Y., on Aug. 7, 2011. Genelle’s story was one of several that inspired documentary producer Tanya Kelen. She decided to tell the story of some of the day’s heroes, who just so happened to have four legs and lots of fur. The special she produced, which aired Tuesday night on Animal Planet, spotlighted a number of incredible dogs, as well as the first responders, veterinarians and dog trainers who made their work possible. There were more than 300 specially trained search-and-rescue dogs at Ground Zero in the days following the 9/11 terrorist attacks. They helped find survivors in the rubble and, later, found trinkets like jewelry that could be returned to victims’ families. Still more canines served as therapy dogs, helping survivors and first responders cope with their emotional trauma. Guzman-McMillan was one of about 15 employees from her team of Port Authority workers who all tried to evacuate the building at the same time. She is the only one of the group who lived. “I felt the walls cave in,” she recalled in the documentary. “It was dark and everything was rumbling.” Pinned under cement and steel and unable to move, she prayed and asked God to help her. Although doctors told Guzman-McMillan that she would never walk again, she defied all odds and now not only walks but runs. She has since married and had two daughters, and she said she has an extremely strong faith. Another incredible story about a dog’s love on 9/11 involves Michael Hingson, a blind World Trade Center employee who was led safely out of the building by his trusted canine companion, a yellow Labrador retriever named Roselle. 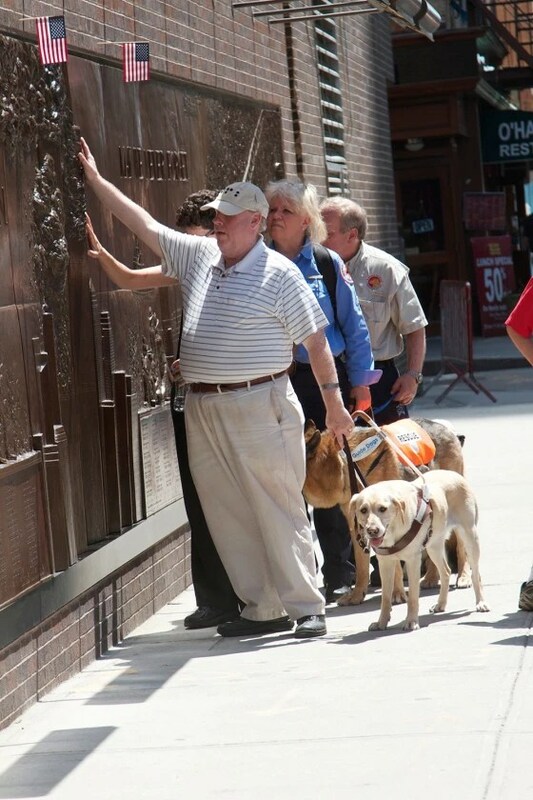 Michael Hingson is pictured with dogs at a 9/11 memorial wall 10 years after the terrorist attacks. Hingson remembers encountering firefighters on his way out of the building. One of them stopped to pet Roselle and cuddle her, even though guide dogs aren’t supposed to be petted. Still, Hingson doesn’t regret what happened. “It was probably the last unconditional act of love he got,” Hingson said about the fireman, who was killed that day in the line of duty. After 9/11, Hingson wrote a book, “Thunder Dog: The True Story of a Blind Man, His Guide Dog, and the Triumph of Trust at Ground Zero,” and became public affairs director for a seeing-eye-dog organization. Roselle traveled the world with him and died at the age of 13. Kelen and her crew also highlighted stories of people like veterinarian Dr. Cynthia Otto. Otto was in charge of health care for the 9/11 search-and-rescue dogs, some of whom got injured from stepping on debris or inhaling smoke. The special also showed how search-and-rescue dogs, many of whom are rescued from shelters, get trained to do their jobs. 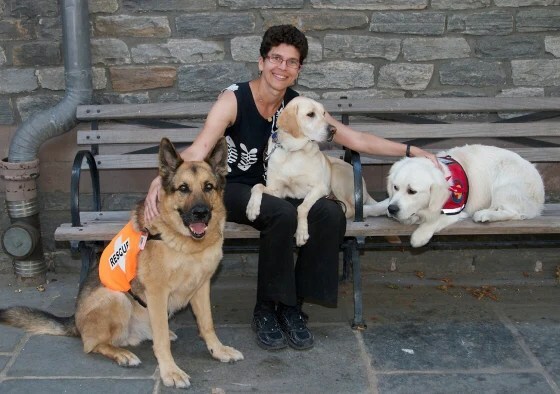 Veterinarian Cynthia Otto is pictured a decade after the 9/11 terrorist attacks.